Deserts have always held a strange sort of fascination for me! I used to look at pictures and read stories about deserts; and yet I had never been in one until I came to America. On some Sundays I accompanied a friend to Anza Borego Desert, and later on she bought a house in another desert and went to live there, and I was able to spend some weekends with her. It was a real experience to rise early and walk into the brooding silence which seemed to envelop everything. It was also interesting to examine the plant life and to note their various methods of survival in those arid conditions. The cacti with their thorns were very forbidding, but another plant which had large hairy leaves, very rough to the touch, held my interest. These, my friend informed me, were called Joshua Trees and after breakfast she would drive me to see a whole forest of these in a nearby valley. I was surprised to find that the desert was no means as flat as it always appeared to me to be, for now we drove into valleys and around mesas, or hillocks, which consisted of layer upon layer of coarse, beautifully colored gravel, or pebbly soil. 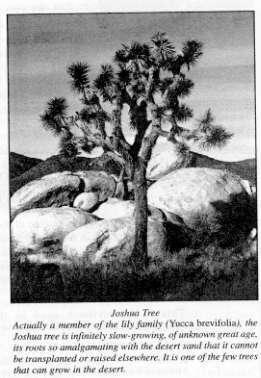 It turned out to be a long drive to the Joshua Tree Valley; and the forest of Joshua Trees was nothing very spectacular, for if you have seen one, you have seen them all! What is more, the heat was becoming unbearable, and we had not thought to bring drinking water with us. Worse still, when we returned to the car we found it had sunk to the sump in sand! What now ? The only solution we could come up with was to hunt around for flat rocks to put under the wheels while keeping a wary eye out for scorpions! But the harder we tried to accomplish this the lower the car seemed to sink! The burning question was-what now? The true meaning of utter helplessness was brought home to us in our isolation! We could have just as well been in another world except for the fact that we caught sight of several coyotes lurking behind shrubs, already licking their chops. How fear can fire the imagination! We were in a desperate plight, to say the least. The vibrations coming from my companions were depressing, and I could think of no encouraging suggestions. The longer I stood there, the more overpowering the negativity became. Dangerous as it might be, I had to walk away! I climbed a hillock to my right so that I could be alone to pray positively in this situation. I had to call upon Heaven, for only God could help us now! Such situations make us realize the difference between prayer from the heart and vain repetition! I could think of no better prayer than the one learned at Mother's knee: "gentle Jesus, meek and mild, look upon a little child." Only now the wording had to be changed to "look upon these Thy helpless children in their present plight." I had hardly finished praying when I became aware of a presence beside me, and in astonishment I looked up into a pair of the bluest eyes I had ever beheld! I can tell you nothing more about this person, whether male or female, or what they wore, for my gaze was riveted on those eyes! I had to look up, therefore the being was tall. "Gather stones," was the command given. I remember nothing of the activity that followed: I cannot recall looking for or lifting a single stone, but I must have helped. All I recall was being back in our vehicle and driving along the tracks made in the sand by the vehicle in front of us, a vehicle out of nowhere, and then suddenly realizing that the car was no longer in sight, even though the countryside was flat for miles around.